Put a nutritious spin on a hearty Italian classic. 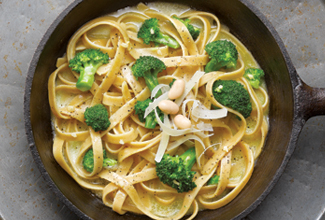 These noodles are made with Bush's Best® Great Northern Beans and blanketed by rich Parmesan cheese and fresh broccoli florets. In a food processor, pulse beans until smooth. Add eggs and salt; pulse until mixed well. In batches, add flour until all incorporated and a dough ball forms. On a floured surface, knead dough ball, incorporating additional flour as necessary. Continue to knead until smooth and elastic, about 6-8 minutes. Cut dough into 12 even pieces, wrapping each piece until ready to use. Set smooth rollers of pasta machine on widest setting. Using 1 piece of the previously cut dough, cut into 4 pieces and wrap 3 of them separately in plastic wrap. Flatten piece of dough into rectangle and feed through rollers. Fold rectangle in half and feed through rollers 8 or 9 more times, folding in half each time and dusting with flour as necessary to prevent sticking. Turn dial down to next (narrower) setting and feed dough through rollers without folding. Continue to feed dough through, without folding, making space between rollers narrower each time, until 1 mm thickness is reached or until desired thickness is reached. To make one serving, boil 5 oz of uncooked pasta for 2-3 minutes or until al dente; drain. In a small bowl toss with 1/3 cup steamed broccoli florets. Toss in 2 Tbsp clarified butter, and top with 1 Tbsp grated parmesan cheese. Try a combination of vegetables or meat. Pasta can also be served topped with tomato sauce, basil pesto or other already featured menu item.